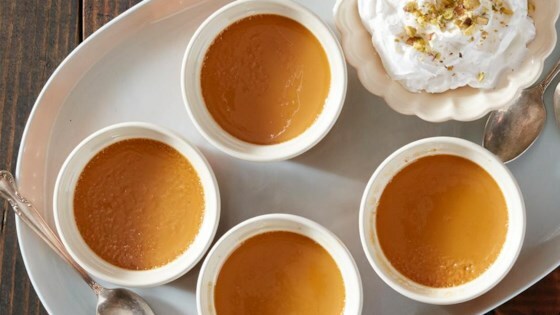 "This super silky treat will be your new go-to dessert from Aran Goyoaga of Canelle et Vanille." Bake for 60-75 minutes until the center of the custard is set but still jiggles slightly. Remove from oven and let the ramekins sit in the pan until cool enough to handle. Dry the bottoms of the ramekins and refrigerate for at least 4 hours. Serve with whipped cream and chopped pistachios. Cover your custards with Reynolds Wrap® Aluminum Foil to ensure even, silky desserts every time!